Everybody loves a wonky star…right…. My final finishes for 2015 and first finish of 2016 has been putting the binding on a couple of wonky star quilts. 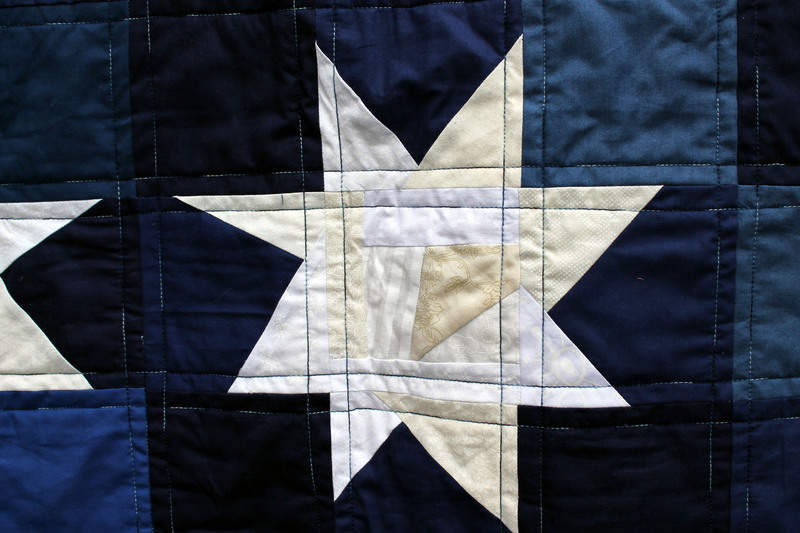 If you follow this blog you know how much I love a wonky star, and I found during my recent health issues that I could make wonky stars without too much effort or thought (I seem to have good muscle memory for this quilt block!)…. What made these quilts so easy for me to make was that I used some of my huge stash of 5 inch squares and lots of scraps. For this first quilt I grabbed a pile of blue squares and my bag of white/cream scraps and got to work. What you can not see too well in the photos is that each center of the star is made up of improv scraps. This is my favorite bit of the process… sewing all the little scraps together to make my own fabric. 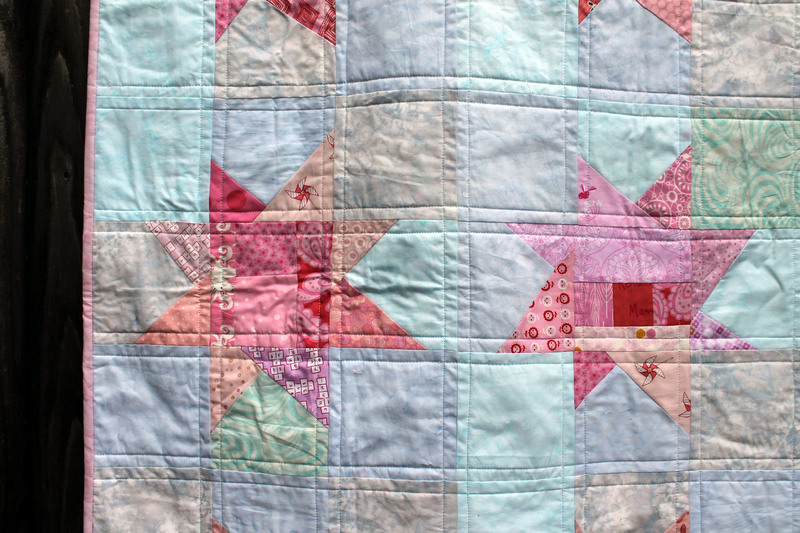 This is my favorite of the quilts… I love how the soft pink and blue play together…. Plus I got to play with novelty prints which makes me so happy. 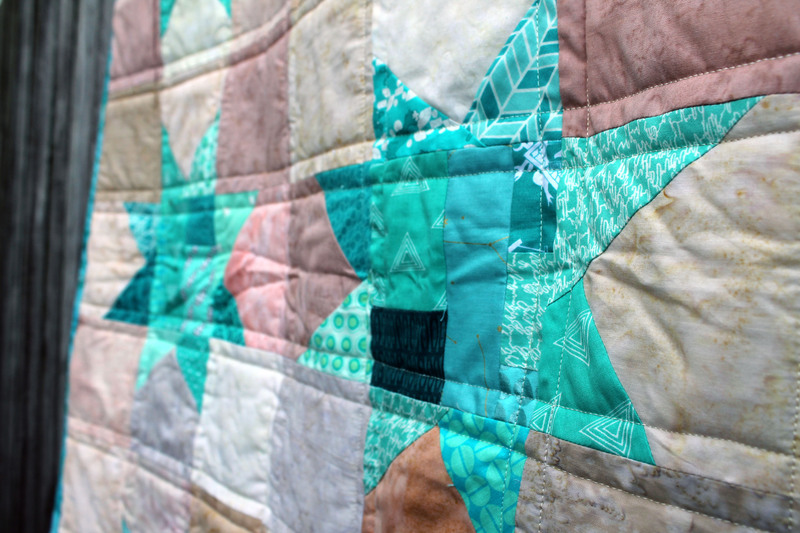 The background for the stars uses 4 different Batiks and with all these quilts the colour variation in the background adds a nice texture to the overall quilt I think. I got to back my pink stars with some of my favorite fabric from Michael Miller. 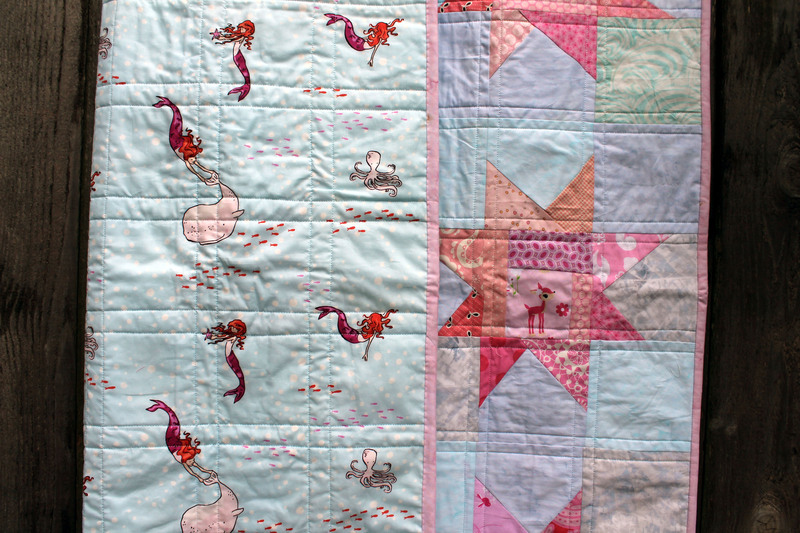 I love the mermaids so much…and this fabric was so perfect for the quilt it had to be used. For the background of this quilt I used creams/beige batiks from a Hoffman layer cake or two. I do not use batiks much in my quilting but I love how they work as a support to the modern quilting fabrics. For this quilt I played with batting loft and used a wool batting. The batting gives the quilt a lovely warmth and softness… it is nicely puffy. I can see why long arm quilters would choose to use a higher loft batting, as it really does make the quilting stand out. So there are my last and first finishes. Very simple, very easy and kind of fun. Each quilt finishes at 41 inches square, a perfect size for our local Pediatric Intensive Care Unit. « Here is to a quilty 2016…. Love the blue wonky stars! Looks so bright!! I’m glad you mentioned the center, scrappy square, I would not have noticed it from the full picture! Beautiful quilts! I love all of these. Great idea. I’m having my own health issues right now and think maybe this is a way I could indulge my quilty self without exhausting myself. Thanks! Love your freedom with fabrics – you just helped me figure out what to make for my granddaughter’s 1st bday! Hope I can knock it out in 10 days!! You are very inspiring! Thank you!! I am delighted to be on team wonky star with you! I love your improv centers. That is such an excellent way to add interest and use up scraps. The children and their parents will be delighted with your gift. I’m so happy to see that being unwell has not affected your great colour sense in the least! I think the last one, with the bright aqua stars, is my favourite; I like how the background punches slightly stronger than on the others, where the stars are the stars! 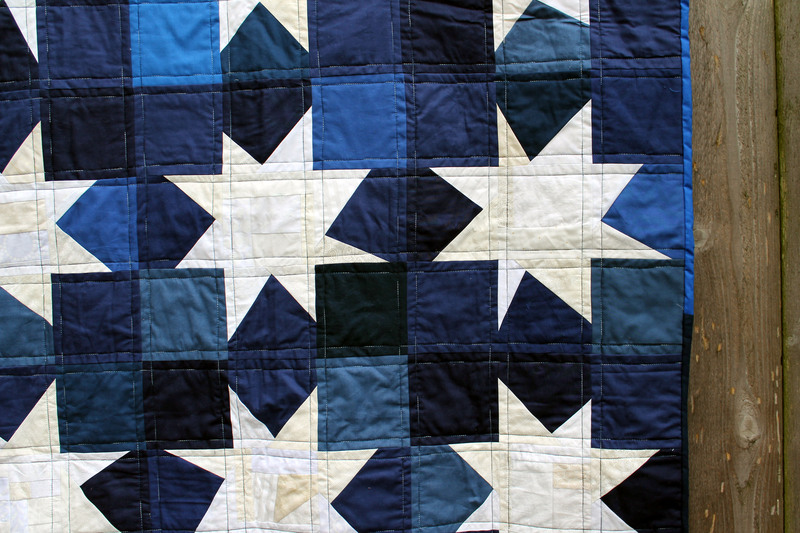 I really love your wonky star quilts, specially the pieced centre squares – well in the ecoomical patchwork tradition. I am your fan! Shared this post on my FB page – just couldn’t resist! Eek! I think you have almost made me a batik convert with the last two quilts. They look great with their textured backgrounds. I love these quilts. I’ve decided that WONKY is my new watchword. So glad you feel up to doing quilting. Happy New Year. Wow, those are awesome! I do love wonky stars but you really raised the bar with the improv piecing. Love this! What a wonderful way to use up scraps! So pretty! 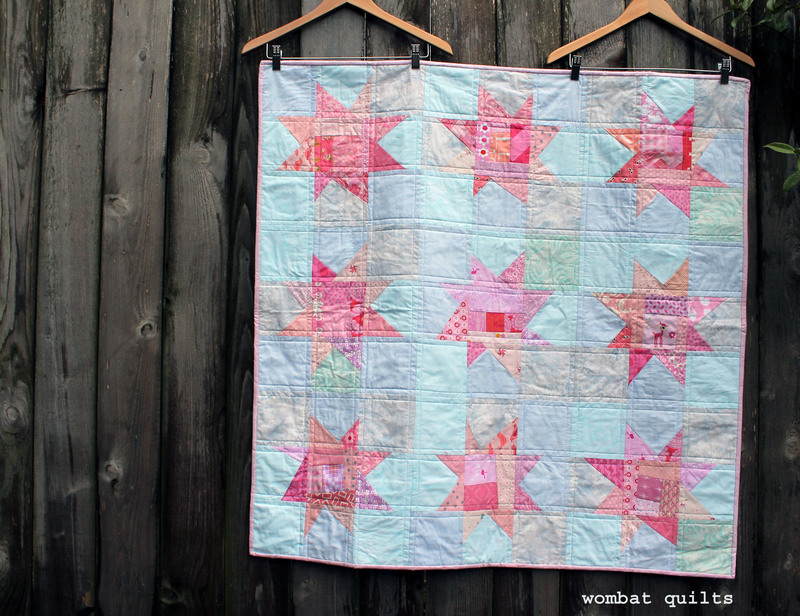 I love wonky stars, although I have not yet made any (I’m a pretty new quilter and just haven’t got there yet!). I also really like how batiks can complement modern fabrics, especially solids. They add a little dimension without taking over the way prints sometimes can. great quilts !. 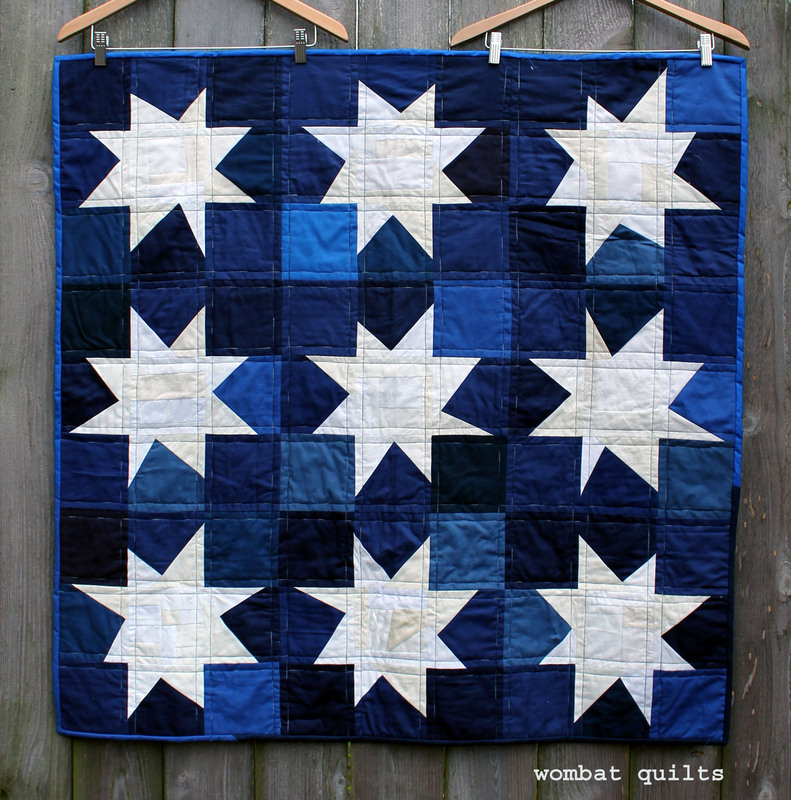 I fell in love with wonky stars a long time ago…great to see them in your quilts- quite fun! Love these, the blue one being my favorite. And I think I’m loving your use of variegated thread too! Wonky and improv, along with solids and negative space, are my comfort zone with quilting. I’m not a perfectionist and wonky works for me! I’ve just been sewing my first wonky stars this week. Fun, and I love how they are turning out. so sorry to learn that you have been having health issues. I hope you are on the mend, as your quilting might suggest! I was very sick for two years, and when I could find the energy to get into my messy sewing room and sew a little bit, it was so good for my spirits. Be well! 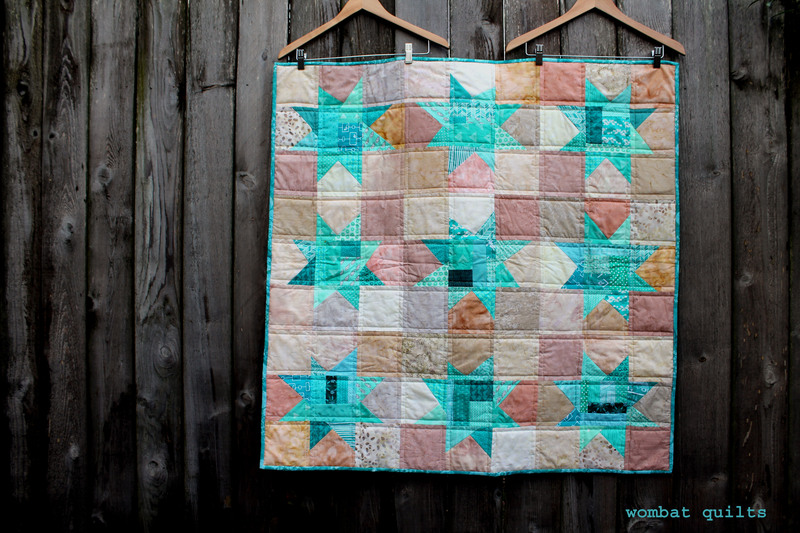 These quilts are so pretty! I love the colors.